Habit: Annual; sticky, strongly scented, densely stalked-glandular, glandular-puberulent, proximally +- sparsely long-soft-hairy. Stem: erect, often stout, 10--150 cm, green, aging red. Leaf: alternate, sessile, clasping or not, 0.5--12+ cm, reduced distally on stem, linear to lance-linear or oblanceolate, often curved, acute, entire or toothed. 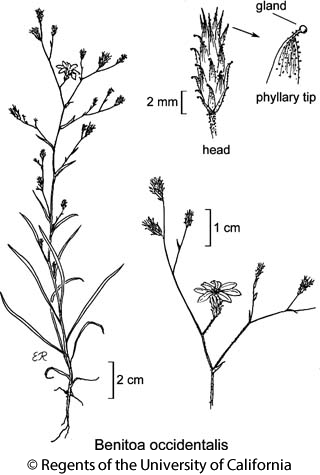 Inflorescence: heads radiate, in open panicle-like cluster; involucre 8--10 mm, narrowly fusiform or obconic to cylindric, erect, persistent; phyllaries graduated in 5--8 series, linear, long-tapered, abaxially glandular, tips straight to curved outward, each tipped with 1 large, stalked gland; receptacle flat or rounded, glabrous, epaleate. Ray Flower: (2)5--8(14); ray 5--7 mm, yellow, occasionally red-tinged, occasionally rolled under; style generally with 1 prominent branch. Disk Flower: 9--20+, staminate; corolla 4--5 mm, narrowly funnel-shaped, yellow, occasionally red-tinged; anther tip narrowly triangular; style tip 1.5 mm, cylindric, distally bristly, branches short, tapered. Fruit: 3--4 mm, strigose, mottled purple-brown; pappus deciduous, of 2--8 slender, white bristles. Chromosomes: 2n=10. Citation for this treatment: Staci Markos 2012, Benitoa occidentalis, in Jepson Flora Project (eds.) Jepson eFlora, http://ucjeps.berkeley.edu/eflora/eflora_display.php?tid=1653, accessed on April 19, 2019. SCoRI (w Fresno, se Monterey, se San Benito cos.). Markers link to CCH specimen records. Yellow markers indicate records that may provide evidence for eFlora range revision or may have georeferencing or identification issues. Purple markers indicate specimens collected from a garden, greenhouse, or other non-wild location.